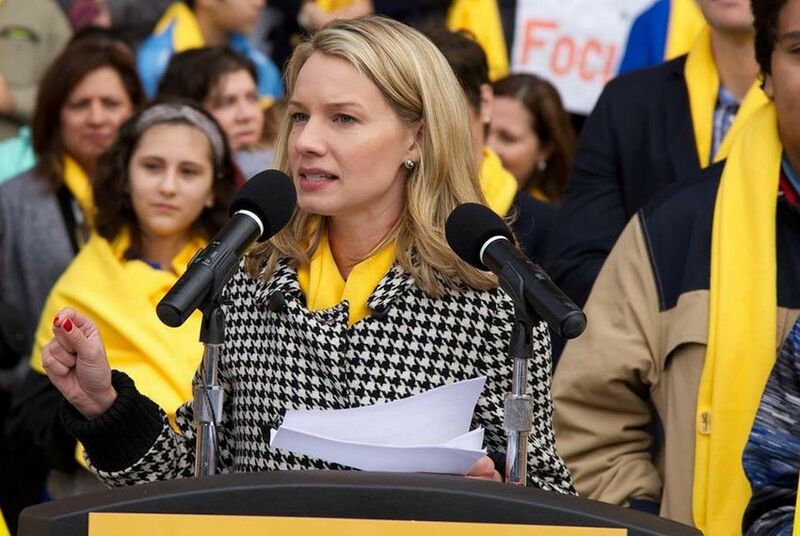 Texans for Education Opportunity Executive Director Randan Steinhauser, also an adviser for National School Choice Week, speaks during a school choice rally at the Texas Capitol in 2015. *Editor's note: This story has been updated to note that Texans for Education Opportunity co-founder Stacy Hock was appointed by Gov. Greg Abbott to the Commission on Next Generation Assessments and Accountability. Monty Exter, a lobbyist for the Association of Texas Professional Educators, said education savings accounts are worse than vouchers because there is no good way to control how parents spend the money. The states that have implemented such programs have included no provisions that allow them to reclaim money if parents spend it on "a flatscreen TV or a bag of crack," he said. "Who's to say that a laptop isn't an educational expenditure, but who's to say that it is? Who is going to police that?" he said. "Are we going to pay someone at the state level to monitor this program, and how much is that going to cost?" But Steinhauser said such a program would have “the biggest benefit to families” because — unlike private school vouchers — it would empower parents to choose the option that works best for their child. Literature provided by Texans for Education Opportunity, which appears to be the first statewide organization focused solely on school choice, suggests the state offer up to $7,800 for any student pursuing an alternative schooling route. The group, whose board of directors includes former U.S. Sen. Phil Gramm of Texas, has so far raised more than $100,000 from a variety of local and national organizations to fund its work, Steinhauser said. And it expects to raise hundreds of thousands more dollars through the political action committee it will form this fall to dole out campaign contributions to the state lawmakers who assist with its mission. “We’ll be supporting legislators who stand up and fight for an education savings account during the session” next year, Steinhauser said. Creating such a program is a top priority for Lt. Gov. Dan Patrick, who has tried unsuccessfully to do so since he was a state senator. Last year, under his leadership, the Senate passed a bill that would’ve provided up to $100 million in tax credits to businesses that donated money for scholarships for school choice families. But it died in the House, where a bipartisan coalition of lawmakers has long blocked such proposals. Steinhauser said she has worked closely with Patrick since her 2013 move to Texas, where she was surprised to find that school choice initiatives weren’t further along. She had previously traveled the country lobbying for school choice legislation as national director of external affairs for the American Federation of Children, the nation’s largest school choice organization. In addition to her new role heading Texans for Education Opportunity, Steinhauser also is an adviser for both National School Choice Week and the Friedman Foundation for Educational Choice. And she is a partner at the political and public relations consulting firm she co-founded with her husband, Brendan Steinhauser, a Texas native whose clients include U.S. Rep. Michael McCaul, R-Austin. Disclosure: The Association of Texas Professional Educators and the Texas Public Policy Foundation have been financial supporters of The Texas Tribune. A complete list of Tribune donors and sponsors can be viewed here.